I prefer the Japanese title Seishun Scandal or Youth Scandal. Then again, you really can’t argue with fists against faces. My Hero, huh? 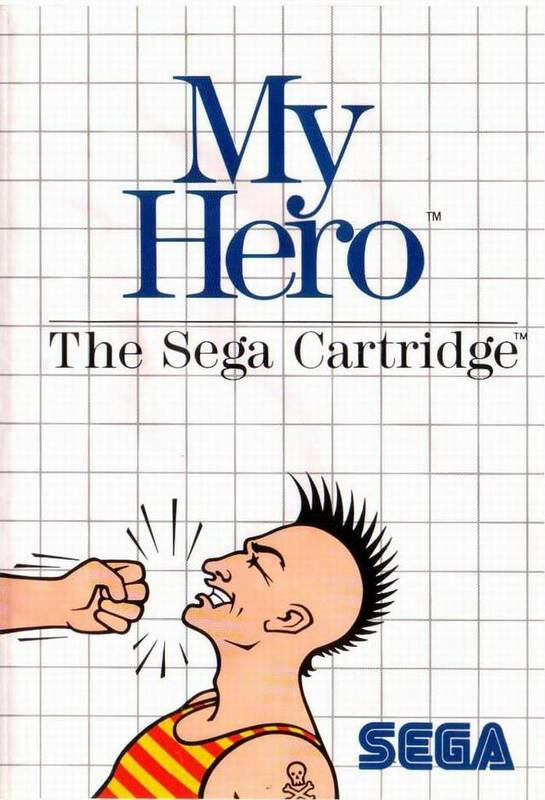 More like “My Poor Shlub who can’t protect himself or his girlfriend to save his life.” Of course, if I were to hold the “can’t protect girlfriend” attribute against the protagonist of My Hero, that would disqualify pretty much every male protagonist in the beat-em-up genre from being considered a hero. The problem with My Hero is that the main character is called a hero from the outset before he’s been given a chance to prove himself. When the game starts proper and hordes of mohawked thugs come after him, one lone punch sends him reeling. One punch! The easy thing to do would be to call the guy “My Zero” and move on, but that’s not really fair. The protagonist isn’t calling himself a hero. The game is making a bold statement, perhaps echoing what his girlfriend might say once he eventually rescues her. How presumptuous: both to assume that the girlfriend would utter some cliche’ phrase like “My Hero!” upon rescue, and to saddle the “hero” tag onto a guy who may or may not stop at nothing to save his beloved. This is the best your hero can do. But My Hero isn’t an in-depth case study on people, their relationships, and how they respond to kidnapping situations. It’s an early beat-em-up, and a bad one at that. It places you in the role of a guy who has to take on the world of Mohawk Gangs with two attacks: a punch which doesn’t work and a jump kick which works some of the time. The Mohawk Gangs have a limitless supply of thugs, while you are just one guy who has to “overcome against all odds.” Unless, of course, you’re brought down by these magical death punches, which happens more frequently than it should. As I mentioned previously, your punch doesn’t work at all. Use it, and you will die because the enemies’ punches will overlap yours. Now, if the thugs just came at you from the front, the game would be over quickly. You could jump kick the lot of them, regardless of their number, and make it to the end in a few minutes. No, the problem lies in the dual attack: thugs in the back, thugs in the front. Which group will you focus on? Once the thugs swarm you, it doesn’t matter what direction you’re jump kicking towards, one of them will get a punch off and you’ll be waylaid. Those mohawks must give them superhuman fists! Street logic at its finest. My Hero supposedly has three levels which repeat ad infinitum once defeated, but I couldn’t get past the first stage. This poor heroic shlub has no life bar and no real way to protect himself outside of jumping like a clown across the city boardwalk. Even then, there’s no guarantees that some cretin won’t just land the right jab to your shin and knock you out of commission while you’re jumping. Early beat-em-up My Hero might be, but even Irem’s Kung Fu Master (released the year prior in 1984) included a life bar which allowed you to absorb a few hits. 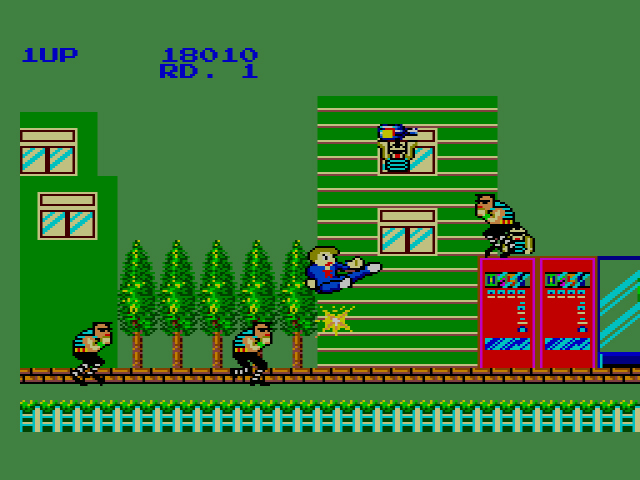 No, My Hero is Sega showing that they have no idea how to handle the side-scrolling beat-em-up genre in 1985. Given the newness of the genre, I can’t blame them for not knowing what they’re doing, but I can blame them for releasing the game at all. A valiant first attempt, My Zero is not. Yeah, there really wasn’t much to say about this one. These early Master System games are either generic or short or both. My Hero is generic, short, AND is one of the worst examples of a beat-em-up I can think of. And yeah, every enemy is more or less the same. Attack of the Daves! When I commented that Tennis was my favorite game on card. You are probrably starting to see why. The card games were pretty crappy. I’ve played the 3 levels and it doesn’t get any better. Dodging some flower pots thrown out of windows is about it. You want to know what is annoying? That same 20 second music clip playing over and over and over as you play. Even if I wanted to keep playing this game I would go insane from the music. Ya I had this and pretty much hated it. I still never played Ghost House , so maybe it will represent the Sega card games better? I somehow doubt it though. Was Astro Warrior a card game? I forget, but based so far on your affinity for shooters, you might like that one. SPOILER ALERT: Ghost House is marginally better than My Hero, but not by much. There’s at least a little creativity in Ghost House. 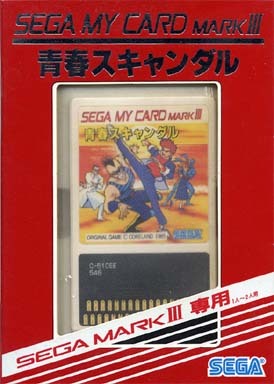 Astro Warrior was actually a cartridge, believe it or not. Ugh. My Hero ties with Captain Silver as my most reviled game on the system. Also here is a short 6 minute playthrough of the whole game. 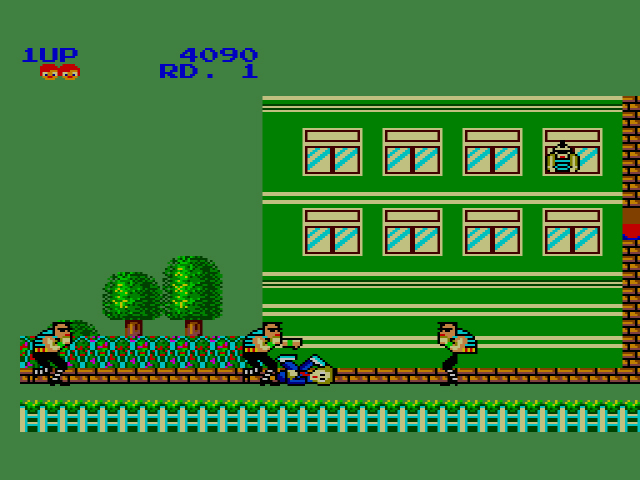 I’d totally forgotten about the guys riding on on pigs, spitting frogs, missile shooting RC cars and boss fight. But don’t let it fool you into thinking the game is fun, it’s not. These six minutes are literally the whole game. Also of note this was based on the arcade game. Which was quite a bit different, meaning it actually had different stages, bosses, enemies and music on every level as well as power ups. This game is basically the first level repeated with minor changes. It’s worth watching the arcade version though just to see the crazy future planet of the apes level. Wow, six minutes, huh? That’s really, really sad. The Planet of the Apes level is a trip, though. My hero is pretty much the Urban Champion of the Master system. I’ve played a lot of early beat em ups that have these same sort of problems. Bland as rice cakes, too many enemies on screen, and under powered attacks. I guess everything couldn’t be Kung Fu but wouldn’t you think these would be obvious problems you’d want to rectify if you wanted your game to be playable? It’s one reason why I like the Double Dragon games so much. The “kill all the enemies onscreen before you can move on” mechanic is so much nicer than “enemies will keep coming at you no matter how many you kill so keep moving, jerk!” Plus they’re a bit more interesting visually than…whatever this is supposed to be. Double Dragon definitely took beat-em-ups to a new level, and it’s only in recent years that I’m starting to see why. The “kill enemies two or three at a time” mechanic, like you said, and the two player co-op, additional moves, etc. Good stuff.